With Mother Nature’s tendency to throw unpredictable, heavy storms at coastlines, you can never be sure your boat is completely safe. You can, however, have a plan to mitigate damage and give your boat the best chance at survival. Use these tips and reminders to help plan for hurricane season. By late October 2017, there were already 15 named storms, and six out of 10 hurricanes were Category 3 storms or higher, making the 2017 season one of the most active hurricane seasons. Disastrous, catastrophic, and devastating were words commonly used to describe the season’s major storms. Harvey, Irma, Jose, and Maria made their marks. And now that another hurricane season is upon us, have you made a plan for protecting your boat? While there is no way to completely guarantee your boat’s safety, planning for the inevitable now will go a long way toward increasing the chances that your boat survives with minimal damage. Here are some considerations you’ll want to cover in your hurricane plan. Mother Nature's Wrath - Boats line the shores of the Florida Keys after hurricane Irma took it's toll. Photo by Zoe Norbom. One of the most important things you can do to prepare for a hurricane is to remove your sails, especially roller furling headsails. If left on the boat, they could easily come unraveled and add a potentially dangerous amount of windage to the boat. Quantum lofts have repaired or replaced many damaged headsails in spite of good efforts to lash them down. Mainsails should be removed for the same reason. At the very least, add extra sail ties to the mainsail. Thoroughly and tightly lash down the mainsail cover. Tie off your halyards tight to help prevent flogging. Consider removing the boom and lashing it flat along the deck or placing it below, cushioned and ready for action. Lower the boom and secure it. Finally, remove canvas such as dodgers, biminis, and awnings. Think through how you’re going to get your sails down and where you’ll store them. Decide on a timeline and criteria, such as the level of storm or predicted wind strength that prompts putting your plan into place. If you’re running to your boat the day before the storm hits, you might be too late. Don’t forget you can always call your local Quantum loft for assistance removing or storing sails. Double-check your ports, windows, hatches, and companionways to make sure they are sealed and secured. Look for potential leakage points throughout the boat, and fix them if necessary. Check all equipment on deck and either bring it below or take it off the boat. Prepare your boat below deck as if you were going out to sea; lash down tillers, wheels, and any other mobile items you can’t remove. Checking your seals and hardware in preparation for strong weather is something you should do before launching your boat each season. 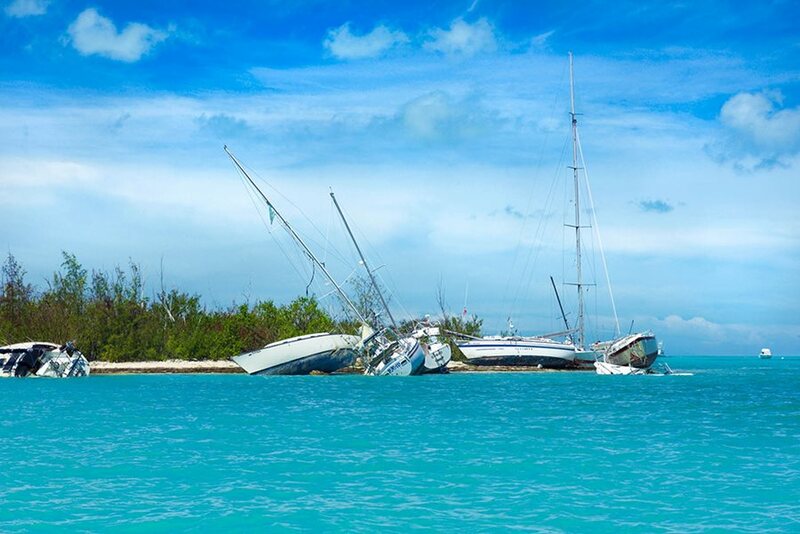 If your boat never leaves the mooring or slip, an annual pre-hurricane season check is recommended. This will give you ample time to fix anything your find before you’re in the path of a big one. The strength of your dock lines and deck hardware is extremely important. Closely examine your lines and deck hardware for damage, and replace them if necessary. Have a few extra lines on hand, and invest in some spring lines as well. During this inspection, make note of the loads the different attachment points can withstand. For example, winches will most likely distribute the load over a larger area, as they usually have more fastenings. Next consider what your boat is secured to. Having the best lines and cleats means nothing if the dock you’re tied to is rotting or your mooring chain is corroded and weak. Talk to the mooring or marina management if you have any concerns. If you maintain your own dock or mooring, spend the money to have professionals service it on a regular basis. Remember to look under the water, too! Factor in the predicted storm surge, wind direction, and tides for your area when making a plan for securing your boat. Consider having a few different securing plans at the ready, including a contingency plan for pulling your boat if conditions merit it. If you are in a marina or a maintained mooring field, the management should be able to assist with your plan. In a long-lasting storm, even the smoothest metal fittings can start to wear away your lines. Protect them by covering more of the line with chafe gear than you think may come into contact with a chafing hazard. This will also compensate for stretch and allow you to tune up your lines. You might have a great hurricane preparedness plan, but that doesn’t mean the neighboring boat does. Install fenders to buffer your boat from piers, pilings, or other boats. When putting out fenders, keep in mind that the storm surge may be big, the wave action could be excessive, and your lines might stretch. Buying extra fenders for a storm can be well worth the investment. Give your boat the best chance at surviving a hurricane by taking all necessary precautions and having a well-thought-out plan. Take time to think through your personal hurricane plan, and be prepared to put it into action before a hurricane watch is in effect. The good news is that once you make your plan, it should carry over from year to year, barring any changes to your location or your boat. And remember, your local Quantum loft is always available to answer questions or guide your to the resources you need. 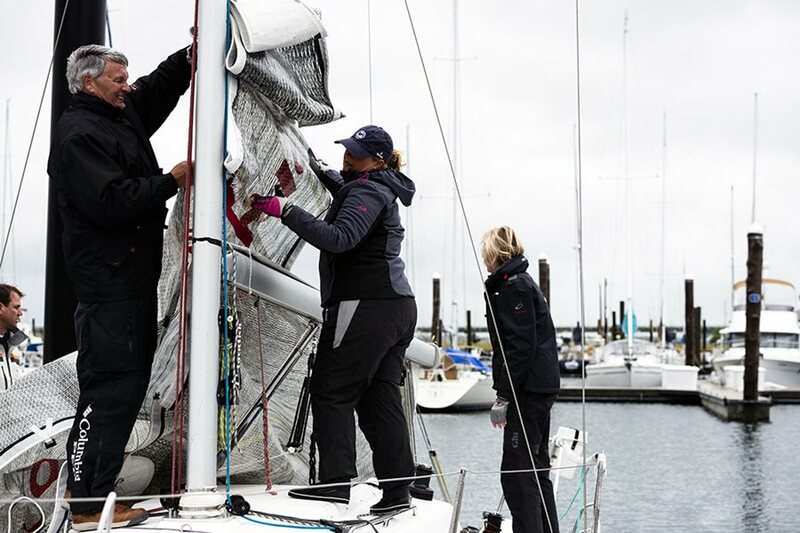 IMPORTANT NOTE: This article provides basic considerations for getting your boat ready for a strong storm and is meant only as a guide to help you plan. It does not cover every aspect or guarantee any outcome.